It's time for another Color Throwdown! Barbara is our hostess this week with a pretty mix of colors--salmon, red, green, and gray. Here's my take on the colors based on the current challenge at CAS(e) this Sketch. I used red, salmon, and green cardstock strips to create a pair of patterned strips. The strips were positioned one on top of the other on a white cardstock panel, then edged with gray cardstock strips to set them off from the white background. 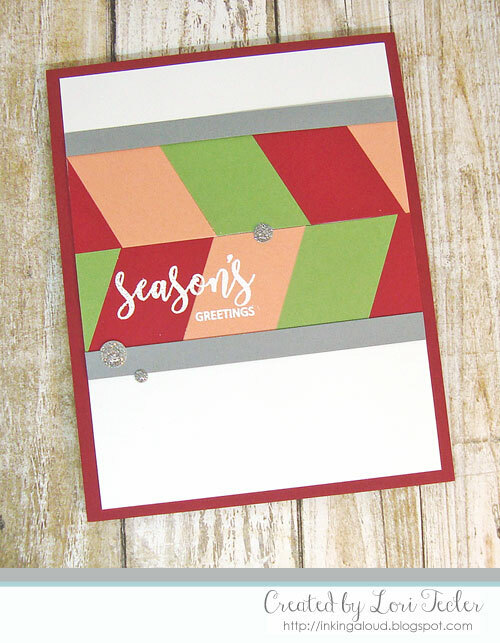 I used my MISTI to stamp the "season's greetings" sentiment from Avery Elle's Christmas Cheer stamp set on the paper strips. The MISTI let me stamp the sentiment multiple times in the same place, which was helpful since I was stamping on two pieces of cardstock. I heat embossed the text in white so it would stand out from the colorful background. After accenting the sentiment with a trio of festive silver glitter enamel dots, I adhered the panel to a red card base. To play along, just create a paper crafted project using these colors as a starting point and add a direct link to your finished project using the linky tool found at the end of this week's CTD post. As always, if you don’t have exact color matches, something close works just fine. 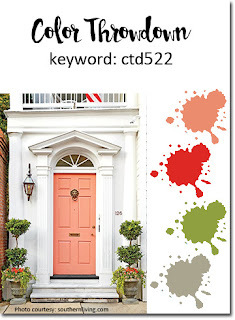 Just be sure that the challenge colors are the dominant ones in your project. 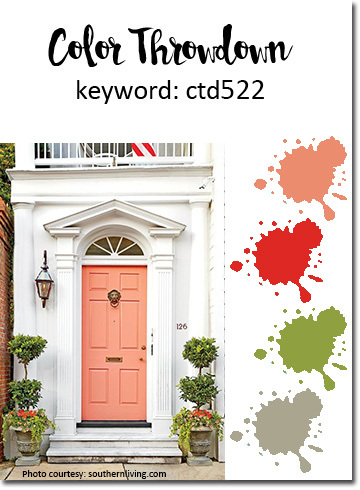 And, if you upload your project to an online gallery, use the keyword CTD522. If you upload your projects on social media, go ahead and use the hashtag #ctd522 and #colorthrowdown. You can find us on Instagram and on Facebook with the username colorthrowdown. Before you get started, here’s some inspiration from the talented Color Throwdown team, December's Guest Designer, Caly Person, and this week's Guest Star Stamper, Soňa Drdlíková.